Pregnancy has been one of the best journeys of my life. It’s not over, but I am already starting to feel nostalgic about not seeing my belly grow everyday, accompany me on adventures or where ever I go. But I am also excited to meet the person who lives inside of me. I mean, how weird is that? I think I can grasp that there is someone growing in my belly because of the kicks, the undulating waves under my skin, my bulging profile, but maybe you just can’t come to the full realization of what is really happening until the wee one is in your arms. I don’t know that yet. And that’s the magic of it all: not knowing, being accepting to what ever is coming your way and making the best of the adventure you started on. And what an adventure it’s been! My baby isn’t born yet, but it’s been to the top of many climbs and mountains with me, while I was guiding this summer and later climbing for myself. When climbing stopped feeling good, I switched to biking, hiking and swimming. I wanted this time of my life to be about exposing myself to new things – since my life has been all consumed by climbing and the mountains for most of my life – because it’s what I would like my child’s life to like. So, I traded my climbing shoes for pedal and bike cleats to ride in California and Utah and later, for paddles while Adam and I discovered sea kayaking together in the Bahamas, and eventually for cross country skis with my mom in Finland. But I missed the mountains and when winter hit our home in Chamonix over Christmas, I was all excited to get back on my skis. 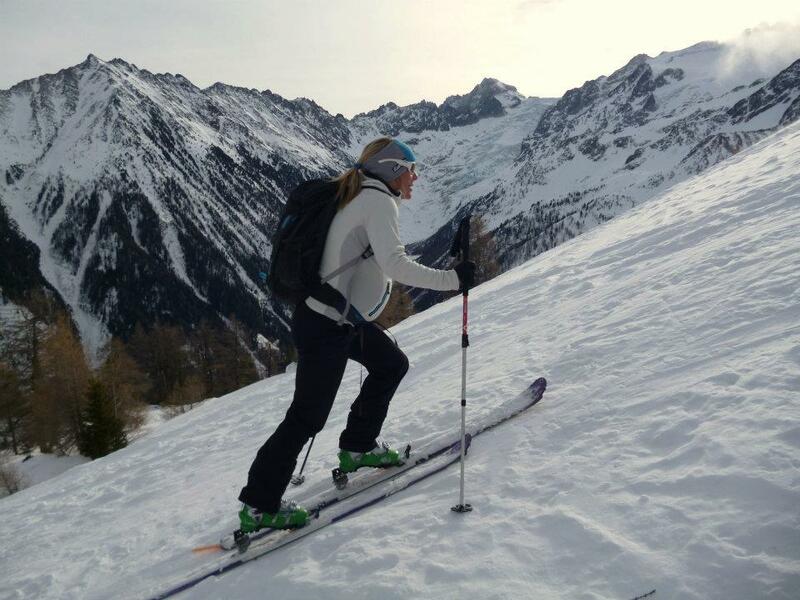 Hiking downhill was a little painful because my baby pushed down heavily on my pelvis because of the impact of each step I took, so skiing came as a relief! – listen to your body: it’s never easy to turn around, but what matters is to listen to your body and feel good about what you are doing. I know that I can tour a few thousand feet uphill before the baby seems to be stretching in all direction making it uncomfortable to keep going. It feels like the baby is putting its hands out and saying: “ok, that was good, let’s go down now, am over it”. 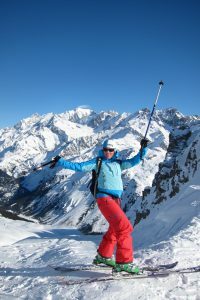 – find partners to join you on your adventure: when I’m not guiding, I often go ski touring on my own and I love it: you can go at your own pace, listen to an audiobook, go up, go down and be home whenever you want. But really, sharing outdoor adventures with friends is one of the most precious things in life and this has taken a whole new meaning for me during pregnancy. I went out with lots of different friends and they always watched out for me, making sure I was ok, worrying about me and it felt good to be on other side of the fence. Although guiding is my life and I love every minute of it, it also felt really good to be indulging in my passion with friends whom I didn’t have to watch out for and just be enjoying ski touring for what it is, without worrying about pleasing other people or about being out there training for guide courses. It’s been an amazing way to reconnect to what I love to do and why I love being in the mountains so much. The hardest part about my “adventurous ” pregnancy has been people’s judgments on how I chose to live my pregnancy. I’ve had an amazing pregnancy, suffering very little from the symptoms that women usually suffer from. Maybe the main reason for that was that I felt I was doing a good deed by taking my baby out for rides, ski tours, and many other adventures, breathing in fresh air, sharing my love for the outdoors with her. “Happy Mom, Happy Baby” is the saying, right? These have been times of deep connection with my baby to be. It was hard at first, because I was guiding a lot and sometimes taking risks that I felt were inappropriate for my baby and knowing that didn’t feel good. Once the guiding season was over, I was able to listen to my body and to what felt ok for both me and the baby. Although I appreciated people’s concerns for both of our health, I also felt that it was really intrusive that people had an opinion on what I should or shouldn’t do. 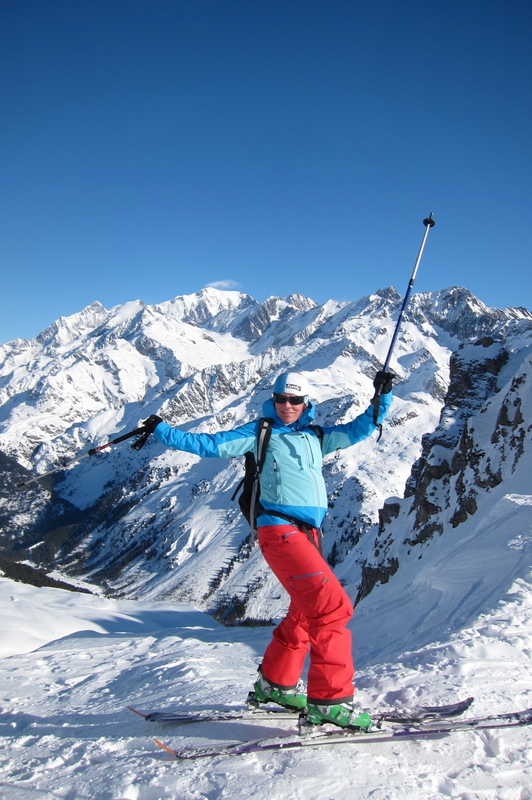 I live in ski resort and the mecca of alpinism, Chamonix, France – and my doctor here deals with more athletic people than probably most ObGyn will ever see. When I asked him if what I was doing was ok, his eyes popped wide open, a smile came to his face and he said: “I only wish I could come along on the tours as well! what you’re doing is great for you and the for the baby. Just don’t go skiing at resorts where there is a risk of people skiing into you. 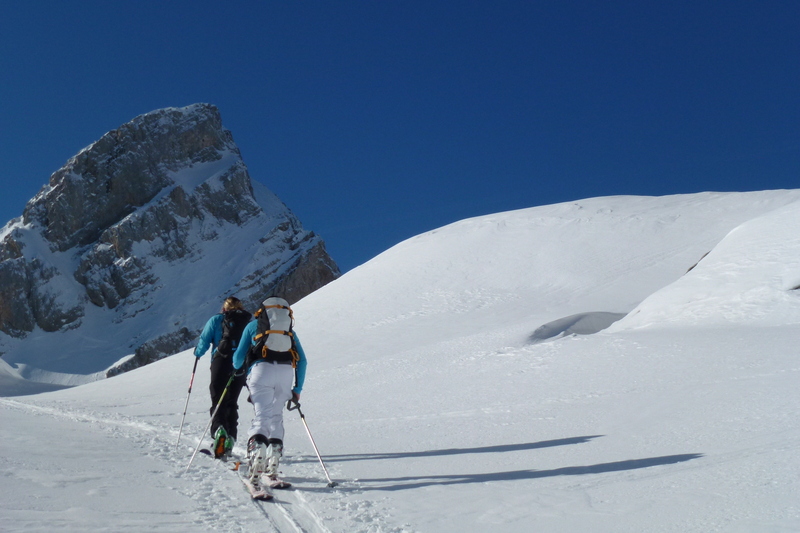 But there is no counter indication to ski touring!”. So, I have seized this opportunity and ran with it. And I wouldn’t have it any other way. I know that this is only the start of people judging what they perceive parenthood should be like. What has held me back for so long from having children is people always saying how much your life is going to change, how your life is going to end. But I strongly believe that you chose your life – parenthood, pregnancy, work, etc. – and you make it what you want it to be. My mom was cross country skiing the day she went into labor. My parents kept traveling and climbing despite having children and all our shared adventures is what made me who I am today: they opened my eyes to new cultures, to adventures and traveling, to living a life outside the norm and it’s made my life that much richer. I am sure people judged them for their choices, but they stuck to what they thought was best for them and for us and that has inspired me more than anything in life. Taking the path less traveled is not always the easiest solution, but it might just be the richest. I hope I can offer at least as much to my child. I think your doctor’s attitude was right on! Glad everything seems to have gone so smoothly. Beautifully said, Caroline. It’s been a spiritual journey for me, following your trek through the path of impending motherhood. You won’t BE a wonderful mother, you already ARE a wonderful mother! Thank you so much for sharing your pregnancy with us, Caroline. I am a few months behind you, and find your stories about continuing to find adventures throughout your pregnancy to inspire me to do the same. Cheers to you and your family! 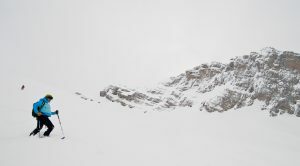 This summer i’m going to reach the summit of Mont Blanc- honestly i’m afraind a little, my physical condition is ok- but my mind becomes pulpy when i hear what my relatives say about it! And i wish you and your baby to stay happy and healthy-as someone said before -you ALREADY ARE a perfect mom! I loved reading this! My baby has been golfing, hiking, swimming, jogging and now the change of season. 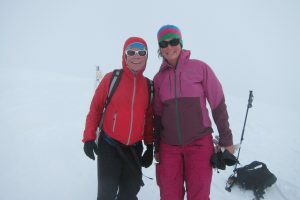 I started off xcountry skiing and snow shoeing. Our ski hill in town just opened and I got out down hill skiing today at 28 weeks. Felt amazing loved every minute! Pregnancy is an amazing thing but no reason to stop every day life! Thank you! I had a child very young and have been terrified to have another (nearly 18 years later!) 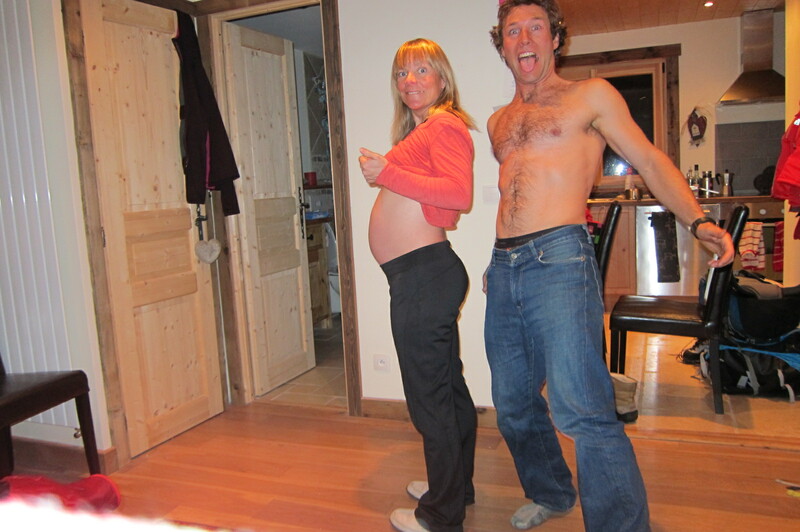 as the perception is that I will have to give up my freedom (skiing, climbing, hiking) to be a good mom in pregnancy and beyond. 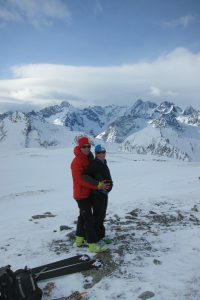 It is very inspiring to see that you are ski touring and climbing while pregnant.